A large body of data has been amassed which convincingly demonstrates that the immune system and the nervous system extensively interact (Ader, Cohen, & Felten, 1991; Miller, In Press). Immune cells and tissues express receptors for a wide range of transmitters associated with and regulated by the nervous system including neuro-transmitters, peptides and hormones, and nervous system innervation of lymphoid tissues has been well characterized. Moreover, the presence of soluble immune products (cytokines) and their receptors have been found in multiple nervous system and endocrine tissues (Besedovsky & del Rey, 1996). Alterations of nervous system function by exposure to a variety of stressors has been shown to result in dramatic changes in immune system function, and exposure to cytokines or various types of immune activation has been shown to significantly alter CNS function (Miller, In Press; McEwen, Biron, Brunson, Bulloch, Chambers, Dhabhar, Goldfarb, Kitson, Miller, Spencer, & Weiss, 1997; Kent, Bluthe, Kelley, & Dantzer, 1992). Given the vast potential for mutual regulation involving the immune system and the brain, there has been considerable interest in the possibility that immune system processes may be involved in the pathophysiology of psychiatric syndromes including major depression. 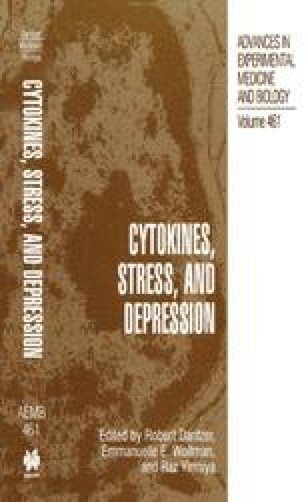 One possible mechanism whereby the immune system might contribute to the development of pathology which manifests as depressive symptomatology involves the capacity of cytokines to inhibit functioning of the receptors for glucocorticoids, thus inducing a state of glucocorticoid resistance.